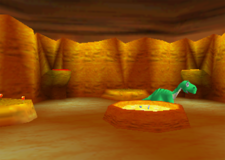 Fire Mountain is a challenge level on Dino Domain in Diddy Kong Racing. It can be unlocked after obtaining the Wish Key in Ancient Lake. In the Nintendo DS remake, Fire Mountain can be unlocked from Taj's Wishes Menu by paying 30 Coins for the "Battle Stage 1" option. Each racer uses a Plane in this stage, and their objective is to be the first to hatch three eggs. In the cancelled 2001 Diddy Kong Pilot, there is an unfinished battle course, Hatch Match, which appeared to have a similar objective to that of Fire Mountain's, as racers could also pick up eggs. Fire Mountain is set in an enclosed, circular location with a large rock formation enclosing the arena itself. As its name suggests, Fire Mountain contains volcanic scenery in the background. A small pit of lava appears in the center and contains a few dinosaur eggs. Racers can fly here to obtain an egg and then carry it back into their nest. Each player's nest appears on a ledge in the higher portion of the stage, with a large mugshot showing which player it belongs to. Shortly after a player takes an egg from pool, another egg spawns in its place. In the lower part of the stage, there are red Weapon Balloons on a rock platform, around the perimeter area, and a large green dinosaur walking around the stage. The HUD is displayed from the top screen, and it displays an icon of each player and the number of eggs they have hatched. When a racer puts an egg into their nest, they must wait a couple of seconds for it to hatch. When the egg of a player is busy hatching, an icon of it slowly flashes on the HUD beneath their mugshot. When an egg hatches, its shell cracks slightly, with two eyes peeking out from it, and the egg stops flashing from the HUD. Players have a few ways to steal an egg from their opponent. They can do so by firing a rocket at their opponent, causing the target to drop the egg they are carrying. Also, while an egg is currently hatching at an opponent's nest, the player can take that egg from them. They cannot steal hatched eggs. This page was last edited on April 14, 2019, at 12:38.